At the same time, there’s a large population of people who often encounter great difficulty getting hired: those with a criminal record. Could this population be the solution to the skills gap? More and more employers, organizations, and government agencies believe there are sound economic reasons for giving people a second chance. Could second chances close the skills gap? 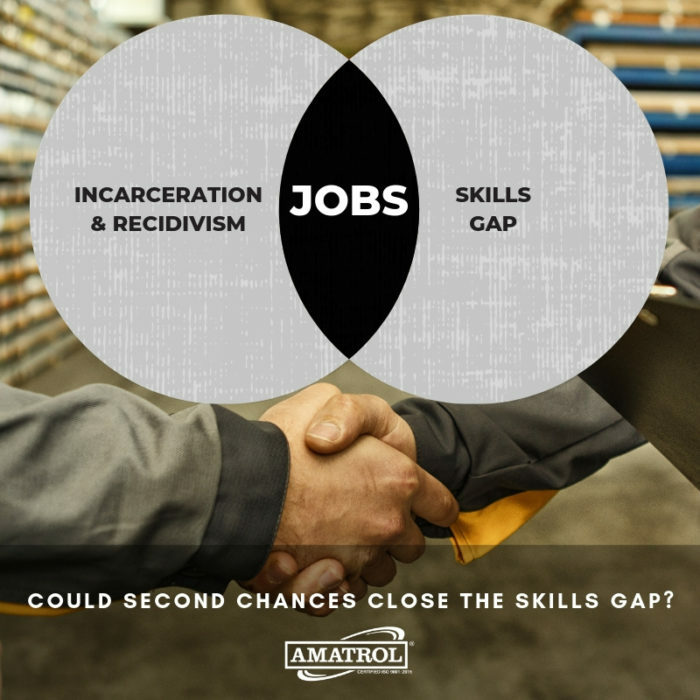 Before we can assess the possibilities, it’s helpful to look at the facts and figures that underlie these two critical problems: (1) incarceration, recidivism, and finding a job with a record; and (2) the skills gap. After considering the available data, we think you’ll agree that skills training holds great potential for solving both of these persistent problems. However, correctional institutions must be careful to invest only in quality training programs that teach the relevant skills that industry needs. People with a criminal record comprise a nontraditional talent pool of surprising size. Currently, there are approximately 2.3 million Americans incarcerated. About 95% of those people will eventually be released. 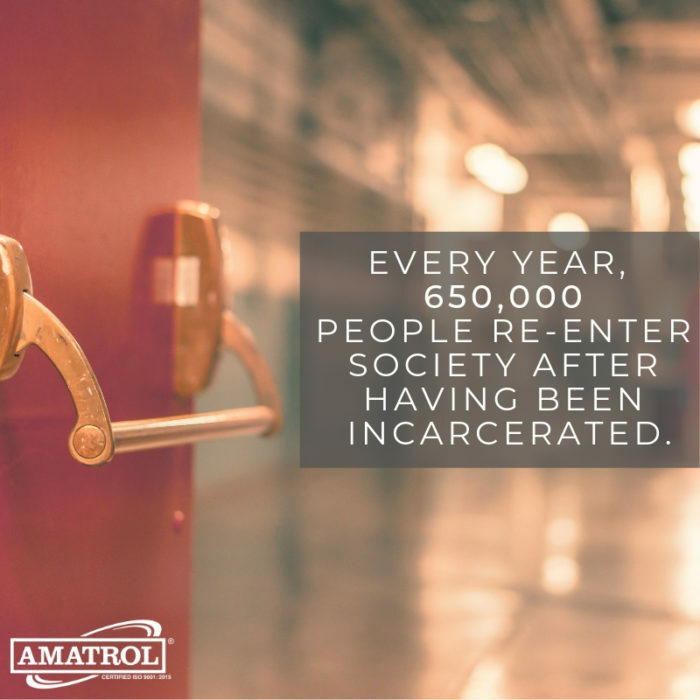 Every year, around 650,000 people re-enter society after having been incarcerated. The majority of these people were convicted of nonviolent misdemeanors. Some reports estimate there are as many people with criminal records as there are those with college degrees. In fact, experts estimate that one in three adults (about 75 million Americans) has a criminal record. This statistic includes those who were arrested but never convicted. Even an arrest that didn’t result in a conviction can haunt a person for years to come, since many employers ask about arrests, not just convictions. Recidivism – the tendency of those with criminal records to reoffend and end up incarcerated again – is a major problem. According to a 2018 Justice Department report, approximately four in nine prisoners are arrested at least once in the year following release. When you extend the horizon beyond one year, the numbers are staggering. Approximately 83% of prisoners are arrested at least once in the nine years following release. Why is the modern criminal justice system a revolving door? Too often, the same story repeats over and over again. Individuals released from incarceration can’t find jobs because of their criminal records. They also often lack valuable skills needed in the modern workplace. To make a living, many people turn back to the very behaviors that got them incarcerated in the first place. The vicious cycle begins again with a repeat offense and another incarceration. 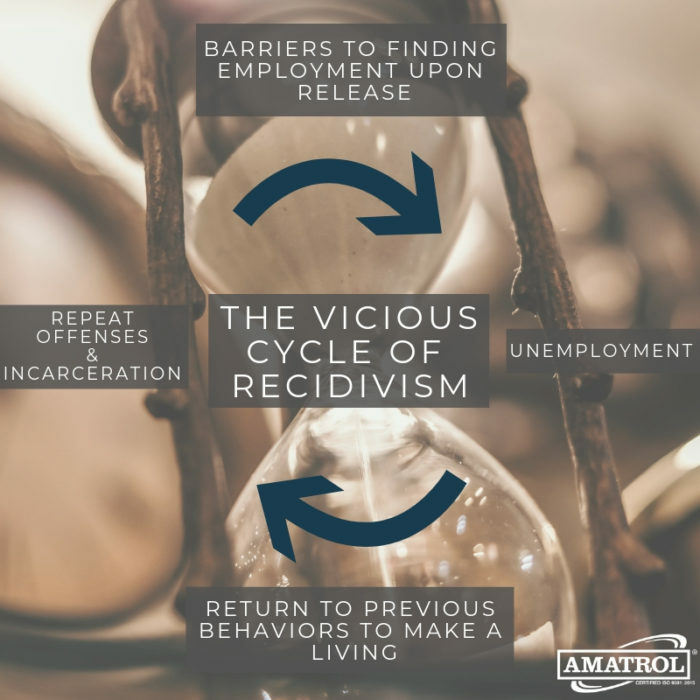 How can we break the cycle of recidivism? Experts believe the most effective deterrent to falling back into a life of crime is finding gainful employment. In fact, the single most important predictor of recidivism is joblessness. Sadly, 75% of formerly-incarcerated individuals are still unemployed a year after release. Even though nationwide unemployment remains at near-record lows, the unemployment rate for formerly-incarcerated people exceeds 27%, a rate that’s far higher than the total U.S. unemployment rate at any time in history, including the Great Depression. “Get a job!” That is the advice all formerly-incarcerated individuals hear from everyone upon release. And it’s good advice, because finding a job is the key to breaking the vicious cycle of recidivism. Unfortunately, finding a job is not easy for people with a criminal record. Significant barriers stand in the way, including primarily the stigma of incarceration. Many formerly-incarcerated individuals also must face the stark reality that they have not yet developed the skills modern employers are seeking. Ask people with a criminal record and most will tell you they feel like second-class citizens, especially in the job marketplace. Because of their criminal record, many people are simply overlooked, weeded out of the process, or not given fair consideration. There is hope on the horizon, however. With reduced recidivism as a goal, many employers, organizations, and government agencies are working together to remove the barriers preventing people with a criminal record from finding jobs and becoming productive members of society. More than 20 states have recently added or expanded laws to help people move on from their criminal records. For example, Indiana’s Second Chance Law, passed in 2013, gives new hope to those with a criminal record by permitting them to petition the court to remove misdemeanor arrests and convictions from public view. Important changes have also been seen at the federal level, as well as via nationwide efforts by organizations like the Society for Human Resource Management. For example, the federal First Step Act, signed into law in December 2018, seeks to improve programs trying to reduce recidivism, such as workforce readiness programs. These efforts tend to enjoy bipartisan support, as a general consensus grows that there are good reasons for giving people with criminal records a second chance. In addition to being a matter of basic fairness, there are also sound economic reasons for doing so. High unemployment rates among those with a criminal record combined with high rates of recidivism undermine public safety and hurt communities, counties, and states whose citizens aren’t productively employed and part of the tax base. Helping people move beyond their criminal records to participate in the workforce helps the bottom line of everyone involved. While hundreds of thousands of people with criminal records struggle to find work, employers across every industry struggle to find skilled employees to fill open positions. Technology is rapidly transforming the modern workplace, creating high demand for skilled workers that are currently in short supply. This wide disparity between the insufficient supply of skilled workers and the great demand for such workers is commonly known as the “skills gap.” According to the Bureau of Labor Statistics Job Openings and Labor Turnover Survey, recent statistics reveal nearly a half-million open manufacturing jobs in the United States. Experts expect the problem to get much worse before it gets better. A study conducted by Deloitte for the Manufacturing Institute estimates that, over the next decade, almost 4.6 million manufacturing jobs will need to be filled. However, because of the skills gap, as many as 2.4 million — more than half! — of those jobs could go unfilled. The skills gap has created a workforce crisis that can’t be overstated. It’s a problem that affects all industries and big and small companies alike. In fact, the National Association of Manufacturers’ most recent Manufacturers’ Outlook Survey revealed that 73 percent of manufacturers identify the skills gap as their top concern. Advocates working to help the formerly-incarcerated move on from their criminal records and find jobs see the potential that this large population has to help solve the skills gap. Providing relevant skills training to people while incarcerated can help them make good use of this time, build competency and confidence, provide hope, and set them up for success upon release. Rather than simply biding their time, incarcerated individuals could be maximizing this time by participating in skills training programs that will equip them to re-enter the workforce as a productive member of society. The impact of skills training on such a huge population has tremendous potential for both the individuals and society as a whole. For example, a recent study by the Trone Private Sector and Education Advisory Council to the American Civil Liberties Union revealed that participation in correctional education results in a 43% reduction in recidivism. As correctional institutions and rehabilitation advocates seek to incorporate skills training into educational programs for incarcerated individuals, it’s critical to keep in mind that second chances will only be successful to the extent that individuals are qualified for open jobs upon release. Limited education and low skill levels are often challenges that contributed to incarceration in the first place, so great care must be taken to provide relevant skills training that will prepare individuals for the types of jobs available in their communities. Amatrol offers learning systems for a wide variety of in-demand skill sets useful throughout industry, including: power and energy, controls, manufacturing processes, design, fluids, fluid power, thermal, electrical, electrical motors, mechanical, communications, robotics, computer integrated manufacturing, mechatronics, and automation. Visit Amatrol online to learn more about how you can leverage our technical training expertise to reach a huge nontraditional talent pool with tremendous potential. Together, we can bridge the skills gap and continue to transform the global workforce one life at a time.